Oh yes, these are AS good as they look. They are flaky, buttery, dilly, cheddary and all around awesome. If you like dill and cheddar cheese, you are ABSOLUTELY going to love these. This recipe is by the Barefoot Contessa a.k.a., Ina Garten. Shawn's grandparents gave me her cookbook for my birthday this year, and I decided to make these for them. :) I did make one simple change to the recipe, I made 36 small scones instead of 16 LARGE ones. 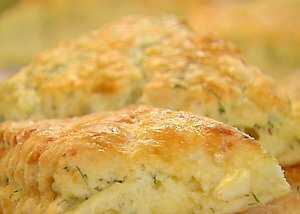 Large scones don't appeal to me because it's too much bread, and simply has too many calories - approximately 400-500 per scone according to the recipe if you make only 16. Without further ado, here's the recipe. Combine 4 c. of flour, baking powder & salt in the bowl of an electric mixer fitted with paddle attachment. Add butter and mix on low, until the butter is in pea-sized pieces. Mix the eggs & heavy cream together & quickly add them to the flour & butter mixture. Combine until just blended. Toss together the cheese, dill & 1 T. of flour - then add to the dough & mix until they are almost incorporated. Dump the dough onto a well-floured surface and knead for 1 minute, until the cheddar and dill are well distributed. Roll the dough 3/4 inch thick, cut into 4 inch squares, and then in half diagonally to make triangles. Brush the tops with the egg wash. Bake on a parchment paper-lined baking sheet for 20-25 minutes, until the outside is crusty and the inside is fully baked.